We’re easy to work with and offer great advice. Each University has its own SHOP NOW page. All Australian University’s present a unique sized Graduation Certificate. We know the exact size of every University Graduation Certificate in Australia. 1. Select your University 2. Choose the Certificate Frame you wish to order 3. Simply checkout and pay. NOTE: We don’t ask for any Certificate Size information during the order process. After you checkout and pay we send you an Email IMMEDIATELY to confirm your order. This email is for you to DOUBLE CHECK our records are correct and match the exact size of certificate you are going to frame. Your frame is then individually handmade specifically to fit the exact size of your certificate. NOTE: If for any reason your certificate is a different size to our records just let us know and we will make a frame to fit the size of your certificatfe. All our Frames are Handmade in Australia – In our factory and delivered straight to your home or office. Why is the price so much lower compared to the university’s supplier. We are a family owned Custom Framing Business specialising in the Online market. We are the Manufacturer and don’t have the expense of Retail Shop Rents or Staff Wages. We don’t pay fees or commissions to University’s to attend Graduation Days. This means you get a High Quality Australian Made Certificate Frame at a better price. Can my new frame be custom made to match the size my existing certificate frame? YES! Please give us a call on 0438 511 218. Your Individually Handmade Frame can be made to any size. The MOST Frequently Asked Question – Will my degree fit? YES! 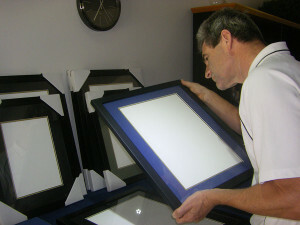 We Custom Make all our Frames specifically for each Individual University. Your Individually Handmade Frame fits the exact size of your degree perfectly – Everytime. What is a Double Mat. require that important documents must be framed with an Acid-free Double Mat. All our frames include an Acid-free Prestigious Double Mat at no extra cost. This adds further protection from damaging pollutants and contaminants between your degree and the glass. Double mats also enhance the prestige of your frame. What can I say on the Personalised Plaque. Line 1. Name of University or ???? Line 2. The choice of – Your Name or Graduate or Graduation Day or ???? Line 3. Your choice of – The Year e.g. 2014 or A Particular Date e.g. 3/9/2014 or ???? Do I send my Certificate to you? Do you insert my Certificate? No. Simple and detailed instructions (with pictures) come with your frame. Simply remove the backboard – position mat board aperture over your certificate – apply tape (supplied and acid-free) and reassemble. There is no option to order a Dual Certificate Frame for my University. Each Australian University present a unique sized Graduation Certificate. Your certificate must be one of the larger sizes. Buying 2 x Single Certificate Frames is the best option. We will custom make a Dual Certificate Frame for these larger University Degrees. IT’S FREE!! There are no hidden extras! Our price includes FREE DELIVERY AUSTRALIA WIDE to your home or office. We use Fastway Couriers to most destinations and Australia Post to regional areas. No. Checkout and select Pay as Guest and use your Credit Card or Debit Card. 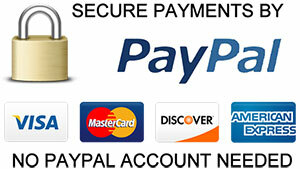 There is no need to set up a Paypal account. Can I pay by EFT or Direct Debit? Delivery Times – How long does it take? All our Frames are handmade to order. Orders are dispatched within 1 – 2 weeks. You will be kept up to date via email at all times. Firstly Relax. It’s easy, we will replace any damaged frames unconditionally and immediately. 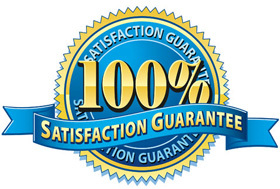 WE GUARANTEE 100% QUALITY & 100% CUSTOMER SATISFACTION. The frame is hand prepared. Our Craftsmen re-check frame quality. When you receive your certificate frame, you will find it packaged with a great deal of care and attention. Each frame is wrapped in thick bubble wrap, and then boxed. Our specially designed and manufactured box is used to ensure your frame arrives at your door in the condition it left us – Perfect. Before framing your certificate we recommend you take both colour and black and white copies and save it to your computer. A copy may be required for future job interviews etc. Certificate Framing does not recommend any of our products for external use and should avoid direct sunlight. When cleaning your frame, dust with a soft, clean microfibre cloth. Do not use detergent or sprays. Designed and hand made in Australia using Italian timber our certificate frames are both bold and elegant. The Italian moulding that our Certified Picture Framer has chosen features the finest materials and finishes. Characterised by a fine gesso, the moulding is easy to cut and less susceptible to chipping and cracking. The wood is universally recognised in the industry as having two highly desirable characteristics hardness and straight grain. Acid-Free Matboard, are a must have. WHY, because the matboards are in direct contact with your Degree, the acidity can cause discolouration and damage. For this reason, at certificate framing we use Acid-free matboards composed of high quality fibre that have been bleached to provide a bright white core, buffered to a pH of 7.5 to 9-5. The smooth white bevels will not turn brown and the extra heavy surface papers allow for a smoother, cleaner cut using our computerised mat cutter. Acid-free foamboard is the new industry standard backing of choice for superior frames, replacing the old MDF boards used in inferior or cheaper products. All our certificate frames are backed with an acid-free foam-core which keeps your certificate rigid and safe from damage. This foamboard will increase the longevity of your graduation certificate. It is 5mm thick, lightweight, very rigid with smooth surfaces and is clean to work with ensuring a great result, every time. Did you know you can get Acid-free Adhesive tape? Yes we even supply Acid-free Adhesive tape that is age resistant and buffered to pH 8.7 so the tape remains acid-free after application and will not turn yellow with time and damage your graduation certificate. It’s simple to achieve a professional result.